This week, Spoonflower designer and paper collage artist, Sally Harmon (aka, Boris_Thumbkin), shares a tutorial on how to create a collection of fabric designs out of a single large paper collage. We’re in awe of Sally’s low-tech, approachable design technique which uses only scissors, paper, a camera, and the editing tools available right here on the Spoonflower site. Read on for the full tutorial below! The process I show here is just one of many ways that you can create a whole collection of fabric designs from a cut paper collage. It’s a method that works for me because it’s low-tech, low overhead, low pressure, and no-stick since there’s no glue involved. 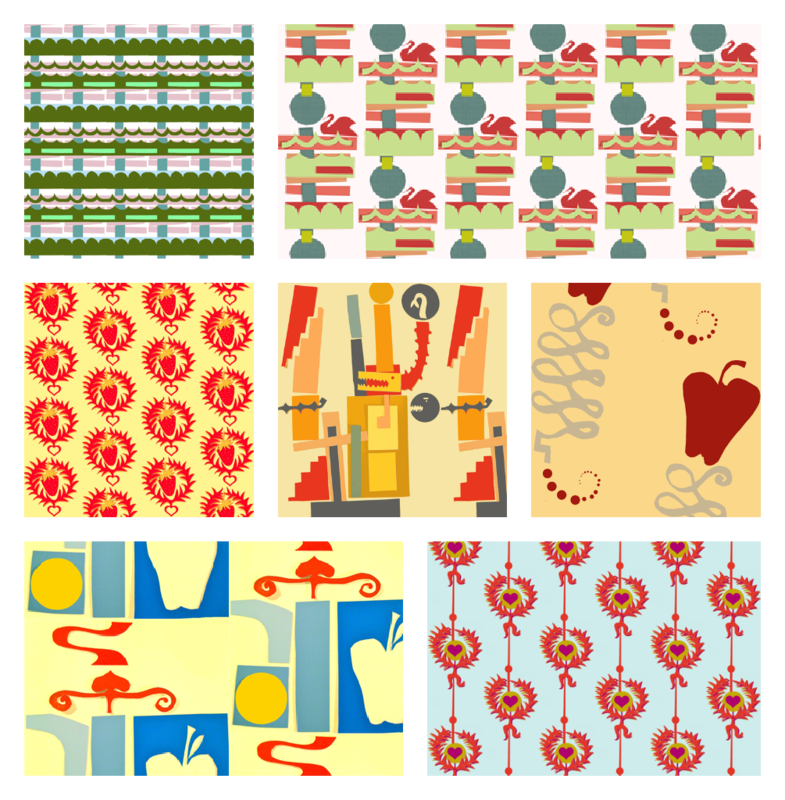 WIth a little luck, you can create an entire collection of fabric designs sharing colors, shapes, and motifs! 1. Collect Paper. For all but the largest and most intricate shapes I like to use paint chips from a hardware or home improvement store. They’re free, they’re colorful, and they lay relatively flat. 2. Cut the Paper Into Shapes. 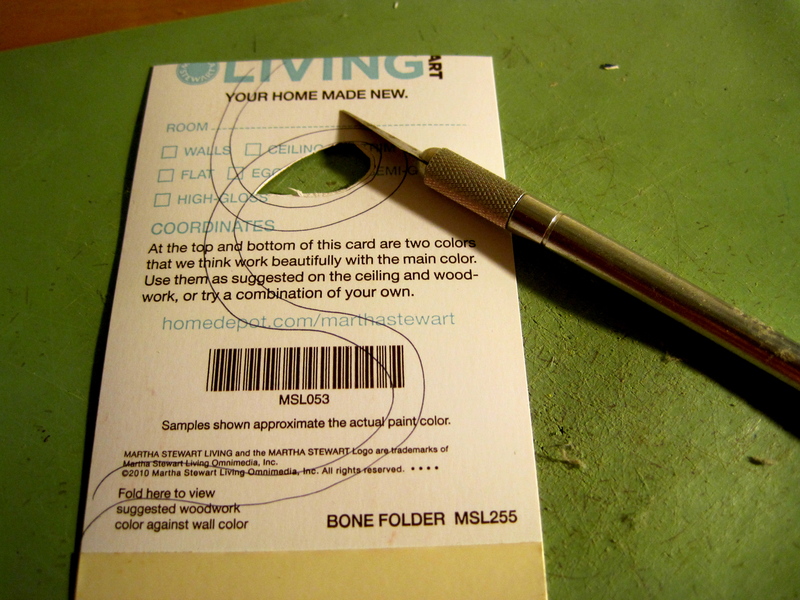 First, trim any writing off the paint chips. Then just start cutting out shapes! I try to do a mix of shapes: geometric and organic, large and small, vertically- and horizontally-oriented, etc. Simple shapes can be cut freehand or, if you want some fancier shapes, try drawing them on the back of the paint chips first and then cutting them out. 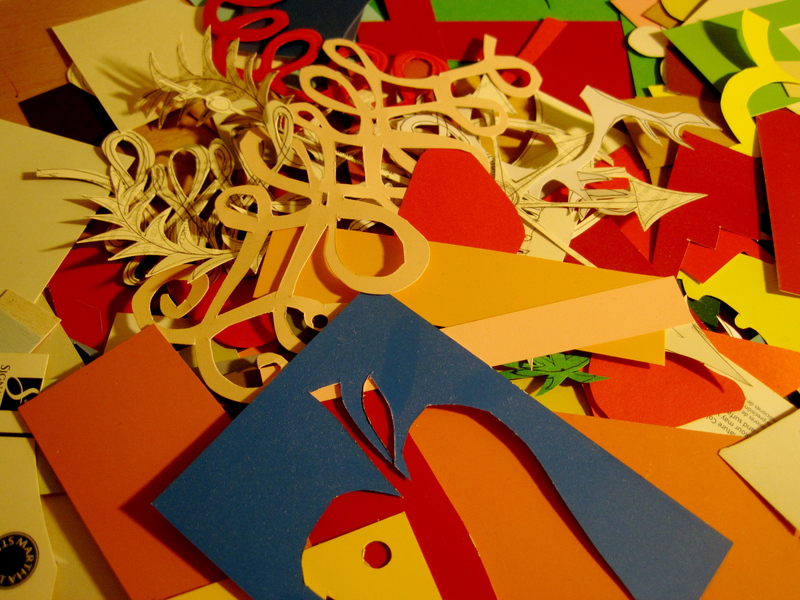 Shapes with parts inaccessible to scissors can be cut out using an X-Acto knife fitted with a #15 blade and a cutting mat or board. Change the blade frequently and don’t rush or worry too much. Most mistakes can be repaired later and some turn out not to have been mistakes after all! 3. Lay Out The Cut Shapes to Create a Collage. 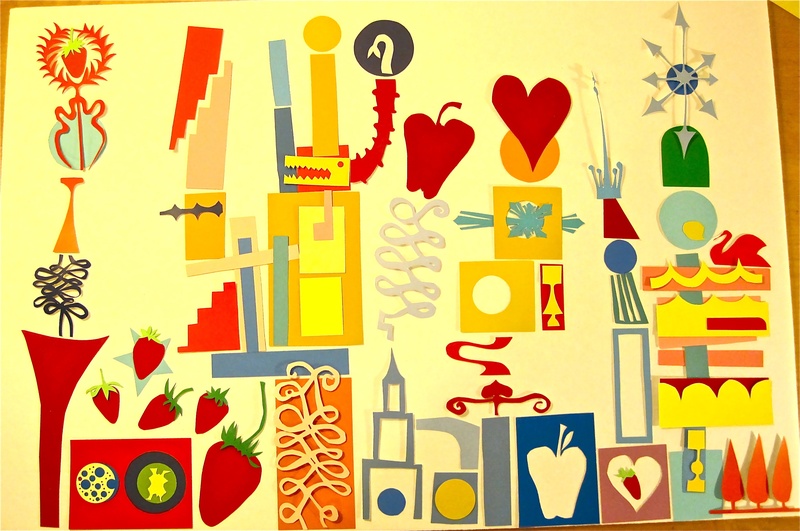 I lay my shapes out onto sheets of 20″x30″ foamcore. These are good because they’re stiff enough to carry around in case I need to move my collage while working on it. Some of the black ones reverse to white so you get two background colors in one piece. And, if I lay out a composition that I end up really liking, I can rubber-cement the pieces down. The 20 x 30 inch size is easily photographed and if I do decide to keep it permanently, it’s also easily framed. Here’s my first pass. 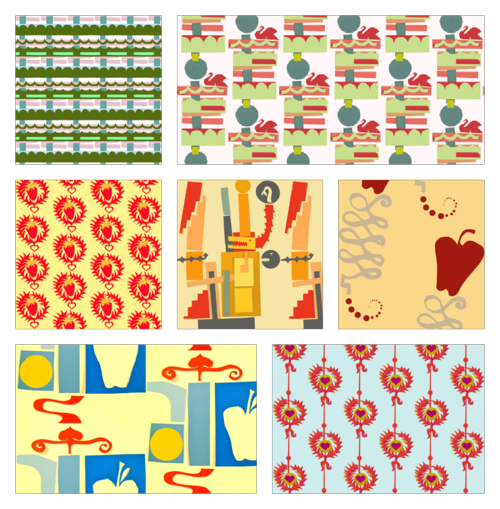 Although I’m underwhelmed by the composition as a whole, I think parts of it will probably work well as fabric designs.